Fluffy and pink, what's not to love about this new season UGG sandal? 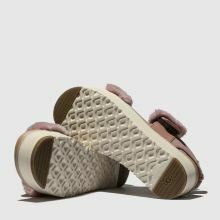 Arriving with sass and style, the Le Fluff profile boasts a fluffy pink foot strap and buckle while a glossy leather ankle strap offers a sweet contrast. A 4cm platform completes.